Wednesday on the PBS NewsHour, Yamiche Alcindor joins Judy Woodruff to fact-check some of President Trump’s claims. President Donald Trump made several misleading statements Tuesday during an hour-long campaign-style speech in Nashville. Trump traveled to Tennessee in part to boost the Senate candidacy of Rep. Marsha Blackburn, R-Tenn. But Trump’s support for Blackburn, who is running to replace retiring Sen. Bob Corker, R-Tenn., was largely overshadowed by criticism that he exaggerated his record in office. Here’s a look at four misleading or outright false assertions Trump made in his speech. Trump said the tax law Republicans passed last year — the Tax Cut and Jobs Act of 2017 — was the “largest tax cuts and reform in American history.” The president has made this claim several times before, including during a White House event last December celebrating the passage of the tax bill. But when measured in inflation-adjusted dollars, the tax cut is the fourth-largest in U.S. history, according to Politifact. And by another key metric — the size of a tax cut plan as a percentage of the nation’s gross domestic product, or GDP — Trump’s tax plan trails several tax cuts enacted over the past seven decades. By that measurement, the largest tax cut in U.S. history was the Economic Recovery Tax Cut of 1981, passed under President Ronald Reagan. Reprising one of his favorite lines from the 2016 presidential campaign, Trump said that “Mexico’s going to pay for the wall” along the U.S.-Mexico border. Mexican President Enrique Peña Nieto, took to Twitter to fact-check Trump in real-time. “NO. Mexico will NEVER pay for a wall. Not now, not ever,” Peña Nieto wrote. He has said that before as well, including after a meeting with Trump in Mexico during the 2016 election. Trump also said, “We have borders down 40 percent,” an apparent reference to illegal border crossings. It’s a claim Trump has made several times since taking office. The number of border crossings did drop during Trump’s first few months in office. But according to a fact-check this month by the Associated Press, border crossings in the past year are up 20 percent, based on the number of arrests by Border Patrol agents. The New York Times has also found Trump frequently exaggerates or cherry picks data on illegal border crossings. The White House weighed in today on the controversy surrounding the now canceled ABC TV show "Roseanne." The network made the announcement yesterday after its star, Roseanne Barr, wrote a racist tweet about an adviser to former President Obama, Valerie Jarrett. The CEO of ABC's parent company, Disney, Robert Iger, called Jarrett to apologize, while yesterday's controversy was playing out. So, today, President Trump criticized Iger. In a tweet, the president said Iger never called him to apologize for what Mr. Trump said were — quote — "horrible statements made and said about me on ABC." White House Press Secretary Sarah Sanders elaborated this afternoon. The president is simply calling out the media bias. No one is defending what she said. The president is the president of all Americans, and he's focused on doing what is best for our country. The president's pointing to the hypocrisy in the media saying that — the most horrible things about this president, and nobody addresses it. Where was Bob Iger's apology to the White House staff for Jemele Hill calling the president and anyone associated with him a white supremacist, to Christians around the world for Joy Behar calling Christianity a mental illness? And our White House correspondent Yamiche Alcindor attended today's briefing with Sarah Sanders. So, Yamiche, a sore spot, a sensitive spot was touched for the president in all of this. And President Trump had tweeted about this, as we said, and Sarah Sanders was deflecting, though, a question directed specifically at how President Trump has been handling this tweet that was blatantly racist by Roseanne Barr. Sarah Sanders does this a lot. When you ask her a question that she doesn't want to answer, what she does is say, no, I don't want to answer the question, and instead I'm going to attack the media, which is what the president has done. I want read for the audience the actual question, so that everyone can be on the same page. The specific question was, why did he, President Trump, choose to address the ABC policy, instead of underlying issues of concern about a racist comment that she tweeted out? So, that was, again, all about Roseanne's tweet. And instead Sarah Sanders said, actually, we deserve an apology for all these other criticisms. And even with Jemele Hill, the comment that she made was not blatantly racist. So, while there is some back and forth about whether or not ABC should have apologized, these were two separate issues completely. Well, this all brings to mind, I think, Yamiche, some of the comments that came up last night at the president's rally. He went to Tennessee to campaign for Marsha Blackburn, who is running for the — what will be the vacant Senate seat there. And he went — or what happened was he made a long speech, made a lot of comments about Ms. Blackburn, talked about his own administration, but he also made some statements that just turned out to be demonstrably not backed up by the facts. I want to — let's listen first to one of them. He was talking about immigrants, deportations. He specifically singled out this Central American criminal gang called MS-13. But let's listen to what he said. Have you seen what they have done? Have you seen what they're doing to us? And we're taking them out of our country by the thousands out, out by the thousands. We have borders down 40 percent, and it's tough because our economy is doing so well, more people try and get in, so it makes it even tougher. Well, that claim is basically false. He is lying when he's talking about those things. The first thing is that it's almost impossible for thousands of MS-13 gang members to have been removed by the United States. I also want to read some facts from the Customs and Border Protection. They say that illegal border crossings are actually up this year. They said that there's about a 2 percent increase from March. And that's really important because the president is essentially saying that we're taking out more people than any other administration, we're here kind of getting these things done. And that's just not true. I think the other thing that is important here is that the president has repeated these claims over and over again. We are going to get to some more, I know. But it's really important for people to understand that he has been saying this for months and that this has proven to be false time and time again. So, another in related — relation to deportations and immigration, the president talked about the border wall, something he's been talking about since the campaign. And here I'm going to quote. We know that he wants this, what he calls it, big wall built along the southern border with Mexico. But he said last night — quote — "We're going to get the wall. We have already started doing it, so we have already started." So, in 2016, the president promised to create a wall that was 1,000 miles long. There have been prototypes shown. He actually traveled to California to look at those prototypes, but he has not actually started construction on the wall. What he has done is essentially said that he's going to replace some old barriers with new barriers, he's going to fix some existing fence. But there is no evidence at all that the wall that he promised on the campaign trail is being built at all. At least they haven't started, which was his comment. So, different subject altogether. The president brought up the tax cuts that he had proposed that Congress passed for corporations and individuals last December. We have already accomplished more than anyone ever dreamed possible. A year-and-a-half, that's all it is. We have not let you down. I will never let you down. We have passed the largest tax cuts and reform in American history. Larger than Ronald Reagan many years ago. This is again not true. The Joint Committee on Taxation, which is a neutral arbitrator of tax analysis for Congress, has said that the tax cuts that he passed in December would add about $1.5 trillion over 10 years. That's how much it would cost. That, even ranked through different analyses, are a lot smaller than Ronald Reagans tax cuts in the 1980s. Historically, people have said that these are probably ranked around third or fourth, but some people have even said that it's eighth. So, this is something that he has said over and over again, because it's a big talking point for Republicans. This was a big victory for them. And he could have just gone on the campaign trail and said, hey, we had this big win. Instead, he started talking about things that are just not true. So, Yamiche, in connection with that, the president talked about how he has created a certain number — a million — more than three million jobs have been created on his watch, and at one point he said wages for the first time in many, many years are going up. Wages are going up. Wages have been going up since 2014, so that again is not something that's true. The president there is claiming that he and his administration jump-started that, when what really happened was that, after the Great Recession, when things hit a really record low, things started getting better. Now, it's really — there is one thing that you can say, that wages can be calculated by hourly or yearly, so you could in some ways see a gray area there. But economists across the board have said that that's also false. And that's another thing that the president has repeated over and over again. And for people sitting at home, we're not saying that this is — that the president is a bad person or that he doesn't deserve to be president, which is I think what the White House is often saying. What we're just saying is that the president could have told the truth and talked about all the victories, and instead he chose to say a lot of things that were lies. And I think we see our role as holding the president and every other elected official accountable, whether they state the facts or say something else. It's our — part of our role is to hold them accountable. 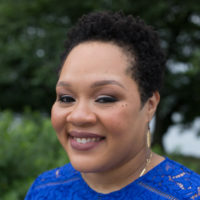 Yamiche Alcindor, thank you very much.